Nothing else limits the success of your exhibit at a trade show than poor dressing! Trade show and conference require a well-planned presentation of your products, services, and brand. The attire of the staff is one of the key factors that decide the sales and leads you acquire. During a trade show or conference, attire works as a symbol of what your brand represents. It creates a psychological impact exactly like your rental booth, lighting, furniture, interior design, and other elements. The attire of your staff members plays its part in visitor experience and visitor engagement. Any individual’s credibility or competency is decided by the attire in the business world. The impact of dressing approach enhances exponentially at a trade show or conference. Formal attire is the peak level of business outfits. Such attires are utilized during many trade shows. Similarly, conferences, evening events and corporate ceremonies require you to up your outfit game with business formals. Casual attire for business is commonly utilized during trade shows. It is important to remember that it is a business casual attire. Hence, staff members are supposed to wear jackets or a suit. No one should use regular casuals such as jeans, sneakers, or sweatpants as business casuals. You can reduce the restrictions of outfits a little bit only. Professional attire is somewhat similar to formal attire. However, it allows you to turn down the intensity a little bit. For instance, you don’t have to wear a tie. You can even choose loafers as your shoe choice. This attire type is commonly utilized to participate in a trade show exhibit. How Does the Attire of Trade Show Booth Staffers Affect Visitors? The exhibitor of a brand hires staffers with some expectations. The business leaders desire to set a certain image with their exhibition. The attire of the staff members assists in creating and managing those expectations. When your staffers stand wearing a well-planned attire, it influences the perceptions and engages visitors. The memorability and the vibe of attire ensure sustainability in business relationships developed during a trade show or conference. The type of outfit should be decided with respect to the industry vertical you are serving. Some industries require elite class formal dressing style, while others need a casual touch to ease the visitors. For example, if you serve the finance industry, your trade show attire needs to be on the formal side. Each enterprise follows its own brand philosophy. You need to ensure that a trade show attire aligns with your business and brand philosophy. For instance, if your brand philosophy involves responsible services at any cost, professional attire seems a valid choice. Just like the brand philosophy, objectives of trade show participation also differ from enterprise to enterprise. It would be wise to make a list of objectives and purposes you want to acquire. Then, use those objectives to decide the attire of staffers. 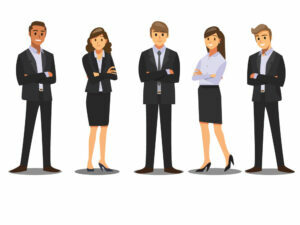 What Dress Code Should you Choose as per your Industry Vertical? In the software and IT industry, you have to be perceived as responsible, innovative and trustworthy professionals. Keeping that in mind, the attire choice should involve crisp business style formals. Formal blazers and conservative footwear are essentials. Depending on the purpose of your exhibit, you choose to add a necktie as an option. Select light blue color shades when selecting the shirts. Blue color is known to be perceived as reliable and trustworthy. You can use the attires of professionals of big software and technology companies. Crisp business formals are required in the automobile industry as well. Customers look for experts to understand the technology and features of an automobile. Hence, your staff during a trade show has to give out a formal vibe. Use formal blazers, conservative footwear, a necktie with white shirts. Corporate executives can use different light shades of colors as well. To give out a fun vibe of an automobile, you can utilize business casuals as well. The staff members can wear a T-shirt with brand logo. Pair it with formal khakis or trousers. This outfit is suitable for front line managers as well as sales executives. These professionals should seem friendly, so visitors can approach them for a product demonstration. These industry verticals require business casuals with an imprint of the brand logo. Choose a T-shirt with a color that suits your brand. Select semi-formal footwear for everyone in your staff team. Business casuals are a way of “dressing down” and balancing it with semi-formal footwear. This attire resembles creativity, innovation, and a philosophy of new ideas. Hence, startups and advertising agencies utilize this kind of attire. Real estate industry should focus on building trust during conferences and trade shows. This trust factor enhances the value of crisp business formals. Formal blazers, light shade shirt with a necktie. You can’t compromise the intensity of formals. Footwear has to be conservative. This kind of attire showcases that your business is capable to handle large projects. It also sends a sense of discipline among the stakeholders, who eventually decide to do business with you. Remove the necktie and keep a formal attire to represent an FMCG vertical. You can decide the necessity of blazers. However, formal footwear is a must along with Oxford shirts that contain your brand logo. Without a tie, team members look proactive and agile, which is a necessary requirement in this industry vertical. Professionals need to conquer ever-changing product categories, distribution channels, and logistics. And this proactive mindset is showcased with this kind of attire. This industry vertical also requires a balance of expertise and an approachable personality. Which is why you need to leverage professional attires along with casual ones. Corporate executives should wear a dark shade formal blazer without a tie. Pair it with conservative formal shoes. The same attire is suitable for senior managers as well. Frontline managers and staff members can wear T-shirts with brand logo with khakis or trousers. This attire makes these professionals look approachable, which increases leads and onsite sales. For healthcare vertical, conservative and crisp business formals work best. All team members can wear the same kind of attire. In fact, it would be better if you choose a single color for shirts and blazers. It should look like a uniform with imprinted brand logo. This kind of well-coordinated attire conveys that you have a big team of qualified professionals who work together for customers. Take the conservative road to business casuals with dark shade blazers. Choose one color code that matches the main color of your brand. This will promote brand recall and superior memory of your service. The aviation industry is all about services, so you want your trade show visitors to remember your brand name, logo, and color. The attire of your front line managers can help you do so. The conservative nature of casual attire conveys a friendly approach to customer service. You can pair the blazer and shirts with semi-formal footwear. Senior managers and corporate executives should look approachable and reliable at the same time. For instance, you can draw some inspiration from the dress code of Richard Branson of Virgin Atlantic. You have all industry-based attire rules for trade shows and conferences now. Here are some additional tips to help you plan your attire for a trade show or conference. Coordinate your outfits in terms of color scheme to look professional. At least one item should promote your company logo. Imprint brand logo on shirts, T-shirts or blazers. Avoid using shiny shoes when exhibiting at a trade show. Keep it neat and polished, but not shiny. Find a balance of professional and friendly appeal of your outfit. Do not go overboard with formal attire, as it would convey that you are over-committing and have no capacity to actually deliver. Moral: Avoid over committing and under delivering with your formal attire. Do not look too casual, or your brand would be perceived as defensive, lethargic and non-reliable. It can convey that your business is not capable of making any commitment at all. Moral: Avoid under committing with your casual attire. Do work on attire and brand alignment. Commit exactly what you can deliver. Moral: Define what you want to commit to your visitors to decide the best-suited attire. Now, you have every information to plan your trade show and conference attire.